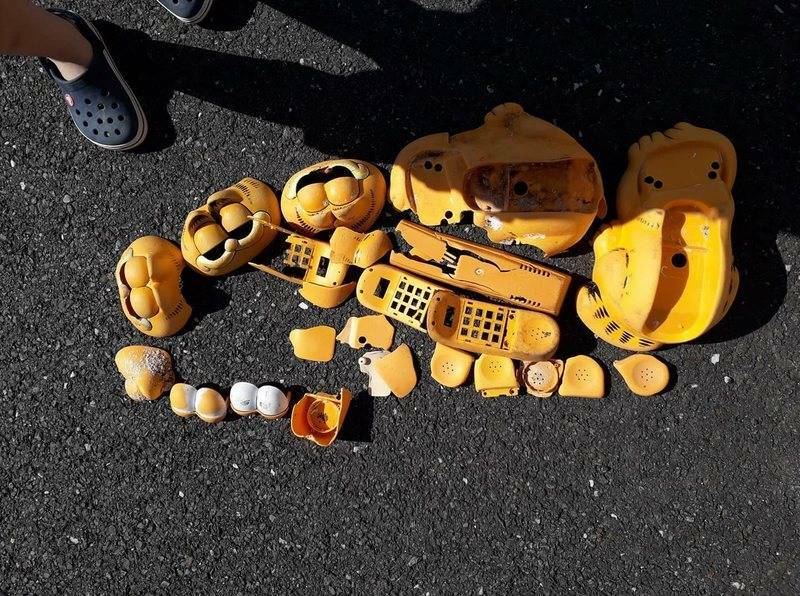 A beach cleanup organization kept finding Garfield-shaped phones and bright orange bits of plastic — then an old, local farmer finally gave them a clue as to why. AR VILTANSOÙThe Garfield garbage amidst an Ar Viltansoù organization t-shirt. For the last 30 years, the Brittany coast in France has been home to a rather unique phenomenon. 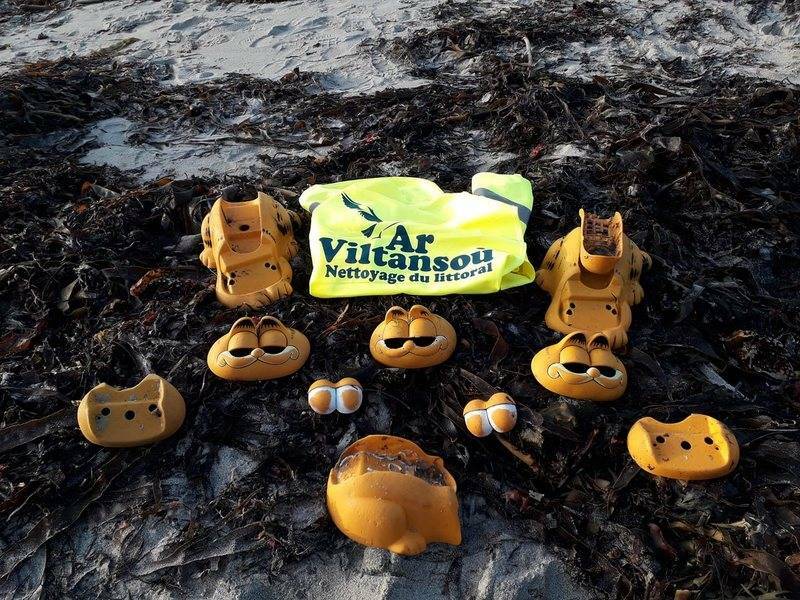 While Earth’s polluted oceans have brought forth rubbish and debris for ages, these French beaches have been hit by one bizarre, recurring item: Garfield telephones. According to Atlas Obscura, the bright orange pieces of plastic in the shape of one of the world’s most recognizable cats have been plaguing this area since the 1980s. A day at the local beach has essentially been incomplete for a generation now without at least a fragment washing onto the sands. “I have friends who tell me their memories of when they were little kids, they were already finding telephones,” said Claire Simonin-Le Meur, president of the Ar Viltansoù volunteer association. The group, whose name means “the kids” in Breton, rids local beaches of trash once a month. The rubbish they encounter is your typical assortment of plastics and fishing debris, some of which has even been found to originate as far away as Florida. The group quickly realized that one particular item kept reappearing, however. When the group recognized how often these plastic pieces were washing ashore — more than 200 fragments of Garfield phones washed ashore in 2018 alone — the quest for answers regarding this bizarre phenomenon began. 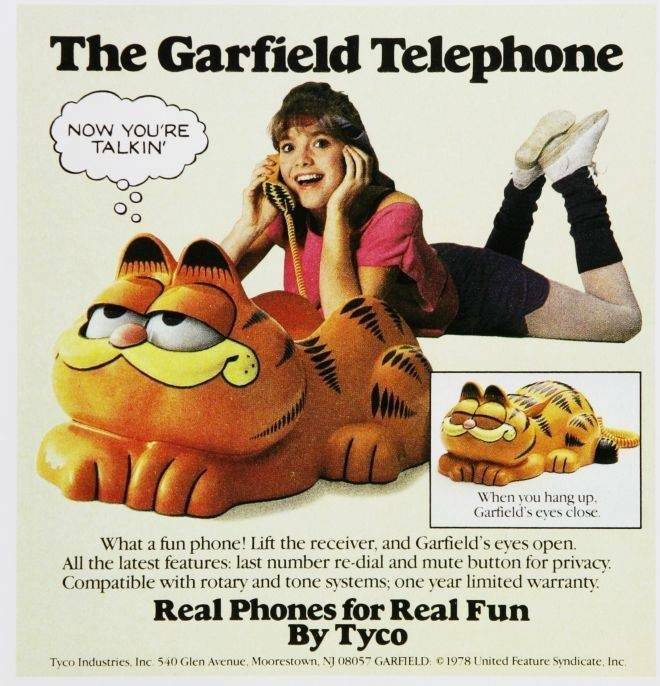 AR VILTANSOÙThe Garfield phone was produced by Tyco, and advertised as “real fun” in 1978. Many of the phones have remained in rather good condition, despite their decades-long existence in the ocean. The lines and stripes forming Garfield’s cartoonish face still pop, and some of these phones still have their internal wiring and electronics in place. For Ar Viltansoù, the Garfield phones have become a lightning rod for the local conversation surrounding global pollution. The phones themselves were produced by American toy company Tyco and marketed as “fun” alternatives to standard receivers in 1978. Of course, for the concerned beachgoers of Brittany, this piece of plastic entertainment is mere garbage. Rumors about the origins of this garbage started swirling a few years ago when mention of a sunken container ship entered the conversation. As legend had it, the phones started washing up when a shipping container went overboard at some point in the early 1980s. It was only a few months ago, decades later, that French news publication France Info ran a story on the strange curiosity. That’s when Simonin-Le Meur ran into René Morvan, an old farmer who knew all about it. AR VILTANSOÙThe cleanup group found more than 200 fragments of Garfield phones in 2018 alone. Simonin-Le Meur met the 57-year-old farmer when her group was removing a number of beached dolphins from the coast near where Morvan owned land. He told her that he knew where these phones were coming from and that he could show her. Morvan told Simonin-Le Meur that when he was 20, there was a pretty bad storm in the area. Coincidentally, the Garfield phones starting washing ashore soon after. Curiosity killed the cat as Morvan and his brother decided to go investigate the debris’ origin and found the wreckage of a shipping container wedged into the cliffs of a nearby sea cave. The container was submerged most of the time, but during low tides, welcomingly revealed itself. Everything Morvan told Simonin-Le Meur was true. She discovered a slew of Garfield phones and pieces of plastic as well as televisions and a sizable shipment of red wood. Once the bad weather finally subsided, Simonin-Le Meur and a handful of volunteers entered the cave. The tide was low. It was March 22. The group found hundreds of pieces, and dozens of handsets with intact buttons and visible numbers. Though the great mystery of the strange Garfield phones had seemingly concluded, some Ar Viltansoù members hatched a new theory that there was a second container nearby. AR VILTANSOÙA Garfield face, intact, amidst the seaweed. Locals have memories spanning back decades of seeing fragments like this when they were kids. Unfortunately, real life is often bleaker than the plausible theories it can provide. There was no second container, and the real lesson here is a simple one: a reminder of our polluting nature. 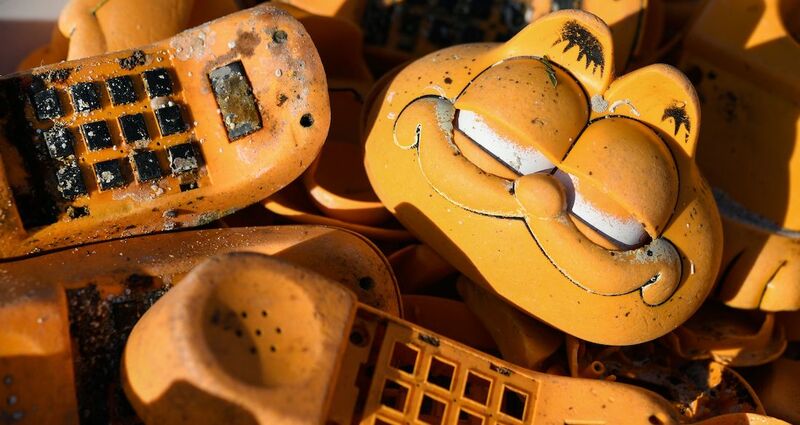 Though these Garfield phones have been found, most plastic in the ocean remains unrecovered. We recently reported on the disturbing prevalence of microplastics in the guts of various fish. It’s estimated that 1,500 to 15,000 containers are lost at sea each year, the contents of which inevitably pollute our oceans even further. If it’s not plastic, which breaks down and gets consumed by mammals, the garbage often consists of toxic chemicals. 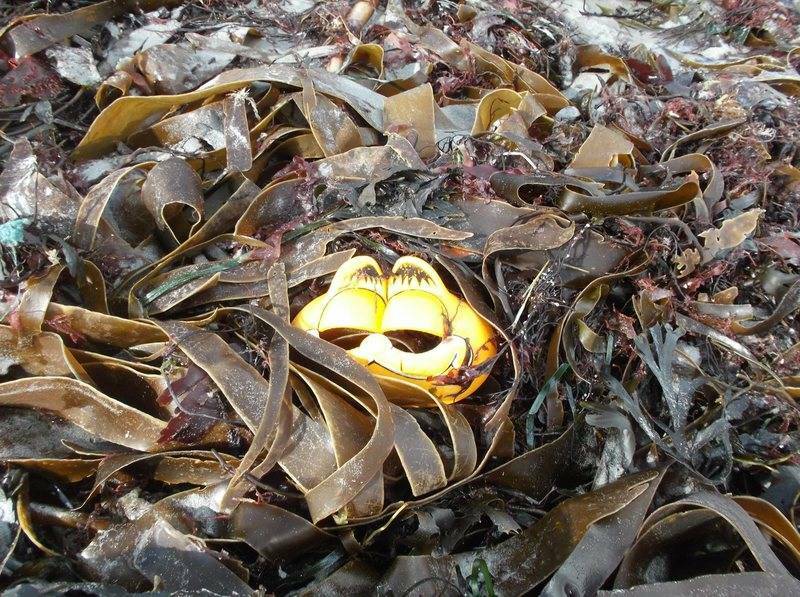 Simonin-Le Meur hopes that this fairly enticing tale of Garfield phones routinely washing ashore on France’s beaches will inspire people to get up and take action. After learning about the strange mystery of Garfield phones washing ashore in France, read about a mysterious sea creature that washed ashore in Indonesia and turned the water red. Then, learn about the rash of severed feet, still inside their shoes, washing up in the Pacific Northwest.